You may not realize it, but your oven’s interior gets very dirty, very fast. Food particles, grease, liquids, and other debris can easily spill or splatter while cooking. It may not seem like a big deal, but a dirty oven can lead to a number of part failures and other repair issues. So the real question is, is it safe to self-cleaning an oven if it’s dirty inside? In this situation, most people’s first thought is to take the easy route and self-clean a dirty oven. We strongly recommend against going that route though, as there are many self-cleaning oven dangers. It’s also not wise to use this feature right before the holidays, as the self-clean oven cycle itself can cause breakdowns and other issues. Avoiding these problems is easy though — don’t self-clean your oven. 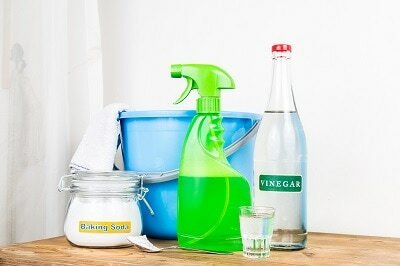 Instead, use a simple, all-natural homemade cleaning solution. Let’s take a closer look at self-cleaning oven dangers. 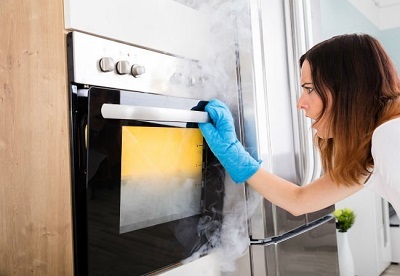 Self-Clean an Oven: Why is it Dangerous? When you select the self-cleaning function on your oven, what you’re doing is cranking the heat up so high that it turns all of the debris inside your oven to ash. That doesn’t seem 100% safe, right? As it turns out, it’s not. 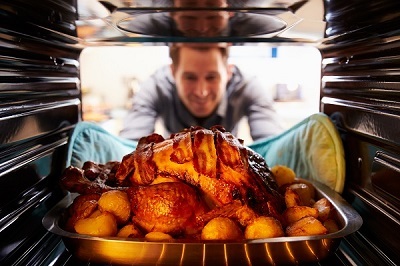 Aside from the risk of burning yourself or your home, self-cleaning oven dangers are mostly due to the gas fumes that are emitted throughout the process. Carbon monoxide is released due to heating up the charred food particles which can lead to health issues for you and your family. The fumes also contain polytetrafluoroethylene toxicosis which is extremely hazardous to pets. Bottom line, it’s not smart or safe to self-clean an oven. Why Not Self Clean an Oven Before the Holidays? If you do decide to self-clean your oven, the inside of your unit will reach temperatures up to, and sometimes exceeding 1000° F. While this will burn away all of the baked on grease and food, it can also cause malfunctions, part failures, and create smelly fumes which linger for quite a while. The worst-case scenario when you self-clean an oven right before the holidays is that it stops working altogether. That will obviously bring Thanksgiving to a screeching halt, so best to avoid that. The fumes created by the cycle also give off a toxic, foul-smelling odor that can hang around your home for hours to days. Resist the urge to take the easy way out and self-clean an oven. Instead, try cleaning it the old-fashioned way using a homemade cleaner (more on that later). You would think that major oven manufacturers would have worked out all the kinks by now when it comes to self-cleaning ovens, but no. Even though it’s a built-in feature, simply using it can cause parts to fail. It’s hard for ovens to dissipate the high levels of heat being produced while ensuring there’s enough air circulating inside during the self-clean cycle. The buildup of high heat can cause fuses to blow, and can even begin to melt your control panel, knobs, and more. If you insist on self-cleaning your oven, please be safe and follow your unit’s instruction manual. We recommend using an all-natural oven cleaner instead though. We’ve shown the dangers and risks associated with deciding to self-clean an oven. It’s just not worth saving yourself from a little work to potentially break your oven, make your whole house smell bad, and even cause health problems. So what should you do to clean your filthy oven? Learn more about how to clean your oven with this solution, and other oven cleaning hacks here. 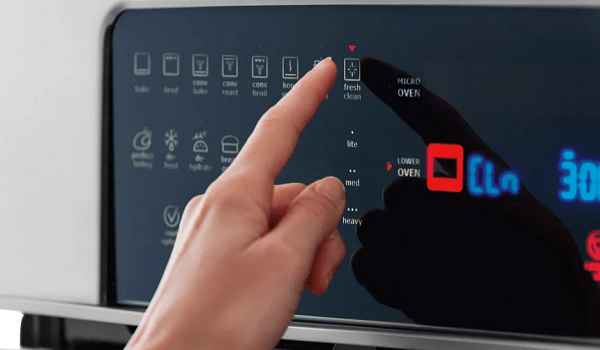 If you’re experiencing any oven problem from using your self-clean cycle, or for any other reason unrelated to self-cleaning, call A+ Appliance Repair today! We’re the area’s most experienced, professional oven repair servicer, and we can get you back to cooking in no time!